Radio Active starts glowing again as the Great Fall Painting Project of ’06 winds down. This time around I’ve got updates on said project as well as the far geekier AirTunes setup I finally got working. Sites of Note looks at Jonathan Coulton music videos shot using World of Warcraft, the world-building third season of the Harping Monkey’s Round Table and the very cool (and very geeky) Portable Apps web site, which provides geeks with self-contained versions of Firefox, Open Office and other programs they can stick on a thumb drive. Finally there’s the much delayed review of A Feast For Crows, the fourth book in George R.R. Martin’s A Song of Fire and Ice series. Note: There was a problem with the show’s MP3 when it was first posted that prevented iTunes from downloading it. The problem’s been fixed; you should be able to snag the show now. 3 a.m. Podcasting: If things sound weird it’s because a) it’s 3 a.m. and b) I’m recording on my Mac’s internal mic because all of my digital microphones are at work. Sitting in the ruins of my office, which I think I’ll work on cleaning up after the podcast. Painting Ghosts: Slow days for Nuketown, Radio Active and just about everything else as Sue and I focus on repainting the living room and library (though didn’t realize until today that it’s been a month since the last podcast — ugh!). Caught up on my podcasts, so I started listening to Stephen King’s The Shining, which I Haven’t read since middle school, or maybe high school (more than a decade at least). Strange listening to it now that I have kids of my own, relating a little to Jack, his temper, and his obsession with fixing the Overlook. Geeking Out with AirTunes: With living room and library finished, got the stereo and TV hooked up again … and finally got to hook up my Airport Express so I can stream music from my Macs to the stereo … very cool! Tonight Jordan was dancing like a crazy girl to the sounds of Rush’s “Tom Sawyer” and “Xanadu”. RADIATIONS Newsletter: Working on getting this up and running again — I’ve got about 400 subscribers out in limbo right now. The new newsletter will be incorporated into Drupal, but I need to work out the kinks. 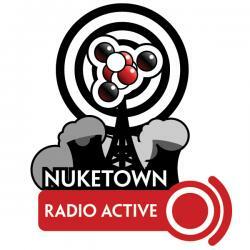 You can also keep current with Nuketown using the “notify” feature — just login and go tot the “notify” section of your user account. Mount Olive High School Class of 1990 Reunion: Just got a letter about my 20th high school reunion, coming up in 2010 (yes, they’re amazingly organized this time around). Didn’t go in 2000 … but might go this time. The focus of this season is world building, culminating with “World Building Month” in January, an event which encourages people to create their own 50,000 word campaign setting. Features portable, flash USB drive-friendly versions of programs like Firefox, FileZilla (FTP), Audacity, Open Office and more! Great for taking your apps (and their preferences/bookmarks/settings) with you wherever you go. Promos Wanted: Had a bunch, but need more. I listened to the unabridged audio book version of A Feast of Crows throughout June and into early July. It’s part of Martin’s monstrously huge A Song of Fire and Ice saga which takes place in land of Westros. half of the series characters through their penultimate story arcs. I say half because it turns out there was just too much happening in A Feast of Crows to fit in one book, so Martin decided to tell half the stories in A Feast of Crows and the other half in its sequel, A Dance of Dragons, which should be finished sometime in 2006. Like all of the books in this series, it can be gut-wrenchingly tragic and almost painful to read, yet at the same time there are wonders to be found. Terrible wonders to be sure, but still wonders. I liked the book, though for the most part I felt like I was biding time, getting through these stories so I could get on to the ones I really cared about, like Tyrion Lannister, Jon Snow and Daenerys Targaryen. The strongest stories were of the twins Jaime Lannister, Lord Commander of the Kingsguard and Queen Regent Cersei Lannister. Jaime’s slow crawl along the path of redemption makes for a compelling, disturbing read — compelling because it’s so well told, disturbing because, well, Jaime did some pretty evil things in the earlier books. Cersei’s tale is one of self-destruction, as a prophesy from her youth unfolds around her. Normally it’s hard to watch tragedy’s ensnare Martin’s characters, but in this case the fall is a welcome one.